Cordova is located in northwestern Illinois right on the Mighty Mississippi River. The bulk of the town is located between Il. Rt. 84 and the River itself, approximately 15 miles north of East Moline (the Quad Cities). The town's population is a peaceful 633 residents. "The school began in 1887 and the last class graduated in 1956 after which there was a consolidation of the high schools in Cordova, Port Byron , and Hillsdale that created Riverdale Unit #100 based in Port Byron. The original Cordova High School was held in a two-story stone building that was used as both a grade school and high school. This building contained four rooms. The site of the demolished building in 2006 was this same site of the original school however the building that existed there in 2006 was not the original. In 1920 the building's upper floors were declared unsafe and classes were moved to the Methodist Church in Cordova. That same year financing for a new high school building was approved. Construction began on a new building in October of 1921 and was completed in August of 1922. The building remained as the Cordova High School building until the school's closing in 1955. At some point, at the site of the original building, a new school was erected and used as a grade school. I am usure of the actual date of this construction but this building continued to be used through the consolidation of 1955. Its usefulness lasted through the 1970s when it was closed due to new construction at what is now known as the Riverdale Elementary Building. This grade schol building was purchased and used as a restaurant known as the "Cordova Landing" for many years. The building was eventual sold and sat empty for several years. The Village of Cordova eventually took possession of the building and had it torn down early this past spring (2006). The web address for the RIverdale HS website is http://www.riroe.k12.il.us/riroe/riverdale/ . School fight song: "On Cordova"
We will win this game! Fight on for your fame. Through research completed on other towns, it is known that Cordova HS competed in the old Two Rivers Conference during the 1940s and 1950s. Member schools included Port Byron, Hillsdale, Erie, Prophetstown, Lyndon, Atkinson, Annawan, Tampico, and Mineral. Cordova High School offered basketball, track, and baseball. . The only IHSA hardware brought home was by the boy's basketball team. Their success is listed below. Season records, coaches' names and other information is needed for this section. We did located some scores regardikng the IHSA State Tourney invloving Cordova on a website titled "Illinois Postseason Basketball Scores." The scores we found are listed below. 1921-22 through 1932-33 Postseason scores, record, and coaches' names needed. Joy lost to Orion in the 2nd Rd. The final season for Cordova High School was the 1955-56 season. 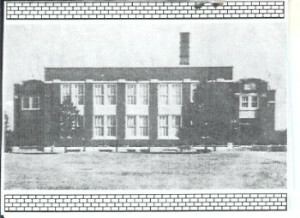 Cordova High School became part of the Riverdale School District in the summer of 1956. Jack Guinn - Was a member of the Two Rivers All-Conference team for the 1952-53 season. "Cordova was named after a Scandinavian who worked on the river in the 1800's loading "Cords" of wood for the passing steam ships. The Scandinavian could only count to 10, so when a passing ship stopped to purchase more than 10 cords of wood the Scandinavian would announce, say for 14 cords of wood, "4 cord ova 10". Thats truely how Cordova got it's name." As stated before, we are in dire need of assistance in researching Cordova High School. What was it used for after it closed as a high school? What were the school colors and team nickname? 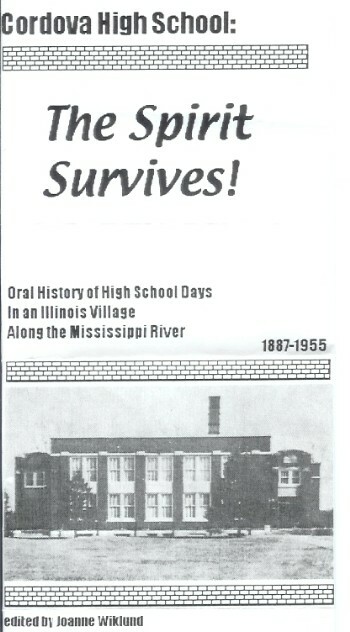 We are hopeful someone from Cordova (or a neighboring town) can provide us with this information and possibly a photo of the old high school building. Cordova High School: The Spirit Lives On!